Forward: DSTRYR/SG has been going strong for over 2 years now and we're only getting better. A lot of our newer readership missed out on some great exclusive stuff from the "early days." We intend to change that by giving you some flashbacks to some of our best material. Here's a great post from back in the day by Daniel Rodriguez (DSTRYR/SG teammate/coach/friend) on pinpointing issues to improve your game. Note the "old school" DSTRYR/SG stylings (we've come a long way since posting this back in August 2009). I'm fortunate to have great teammates. 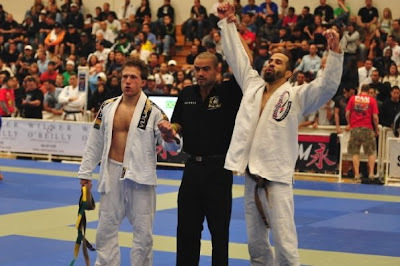 Today's post is by Daniel Rodriguez, a Street Sports brown belt and 2009 Pan American champion. Daniel is like no brown belt I've trained with before - he teaches, competes and trains at the black belt level and demonstrates amazingly athletic and disciplined skills. He's been training in jiu jitsu for 6+ years, and has a strong wrestling and capoeira background. This is a question that I'm asked since starting to teach. However, depending on how big the class is, you may not necessarily get the personal attention and observation that you need for an instructor to effectively answer this question. My answer is always to stop being general and reflect on your own game. Instead of asking your instructor how you can do better, ask yourself that question. Learn to observe your own game, do your homework, and be specific. Find SPECIFIC situations that you find yourself in the majority of the time. This is important because, while you may want to learn how to choke someone out, if you're in on the bottom in side control the majority of the time, a choke technique will be useless to you at the moment. Once you've figured out a situation or position that you want to improve on, ask yourself all the "W"s. Who? What? Where? When? Why? Who's getting me in this situation? What is he/she doing to nullify my game? Where are we both position-wise? When is he/she taking advantage of my position? And, why can't i prevent it? The more specific the question, the faster you'll be able to address your situation. It was difficult for me to prevent someone from passing my guard. (WHO - body-type, speed, strength, skill of person). I was in open-guard and he was in standing (WHERE). He would execute a toreano pass (WHAT). It would happen just before I was able to take grips on him (WHEN). WHY can't i stop him? Once you have all that info, you can present it to your instructor and he/she can help you answer the "how," i.e., how do you deal with the situation. Each situation is broken up into 3 parts- prevention, duration, conclusion. You can prevent a pass, sweep, or destroy a defense before it happens if you know what signs to look for. In the case of my pass, I let him establish grips on my pant ankles. If I don't let him establish grips, the pass is impossible. Second, how do I stop him during the pass if I'm slow and he establishes grips begins to move? There are many positive ways to react such as going to turtle or escaping your hips. Your instructor can help you fine tune the situation that will best meet your needs. Finally, if the pass cannot be prevented, how do i escape from side control? This is when your instructor can give you pointers on your defense if you're late to prevent further attacks and help you escape safely. PREVENTION, DURATION, and CONCLUSION. Three microcosmic situations that happen in a moment's notice, but if you prepare for them, your game will be improved tremendously. Now do your homework and be specific!